Technology is simply the means to an end to develop new processes, systems, and tools, but its influence is being felt in every corner of the real estate industry. Given the dizzying pace and expanding scope of PropTech, though, how can anyone hope to keep up? In their book, PropTech 101, authors Aaron Block and Zach Aarons present an insightful narrative into the PropTech and real estate industry in effort to help ensure that you don't get left behind in the wave of change. This is not an exhaustive look at PropTech; it is, rather, a broad overview of basic history, dynamics, key stakeholders, and trends that serves as a set of keys that will open the door and let you into the PropTech space so that you can begin to explore it with confidence and a mental map of the most important contours. The FUTURE of REAL ESTATE "A real estate revolution is underway, and MetaProp is a master navigator of the emerging trends and technologies energizing this transformation. The team's insight into the opportunities and possibilities is a rousing call to embrace change at an advantageous time. Consider Aaron, Zach, and their colleagues your expert partners in sparking open innovation and inspiring digital transformation at a critical confluence in which adaptation is essential for accelerating success." Jeff Stein Senior advisor to the chairman, AECOM "At Columbia Entrepreneurship, it's our mission to enrich and support the entrepreneurial ecosystem throughout the Columbia community. Part of this involves imbuing traditional disciplines such as real estate with technology, digital literacy, and entrepreneurial thinking. In this way we empower the next generation of our students with the skills and sensibilities that will help them succeed. 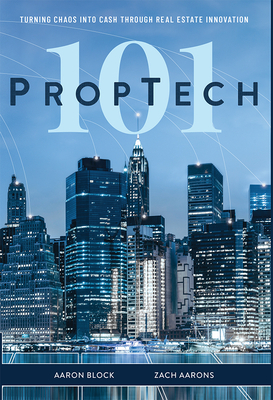 And so it is with PropTech 101--where Zach and Aaron share their access to top minds from around the world as well as actionable insights into the fascinating real estate technology space. Soak this in and enjoy as this book provides a rollicking journey through the exclusive world of elite PropTech investors." Dave Lerner Director, Columbia Entrepreneurship.